Like an inscription written in the turbulent sea-ed corner of an antique map of the old world these dragons speak of horrors in unchartered seas. Rolling in and out of waves. Think of these guys and you'll be sure to crush your collarbone body surfing the Wedge in Newport. Not to be trifled with matey, watch for these two coming up through a swell. Born Yoshihito Nakano, Horiyoshi III (b. 1946) received his current title from the late tebori master Yoshitsugu Muramatsu, also known as Shodai Horiyoshi of Yokohama. Beginning at age sixteen, Horiyoshi III served as Shodai Horiyoshi’s apprentice for ten years. By age twenty-eight Horiyoshi III’s bodysuit was complete, hand-tattooed by Shodai Horiyoshi. Though ukiyo-e officially ended in 1868, Horiyoshi III carries on the spirit of Edo’s “pictures of the floating world” in his work, all the while incorporating his own style and a contemporary perspective. This sensitivity to tradition extends beyond his tebori. In recent years, Horiyoshi has concentrated on traditional kakejiku (scroll paintings). 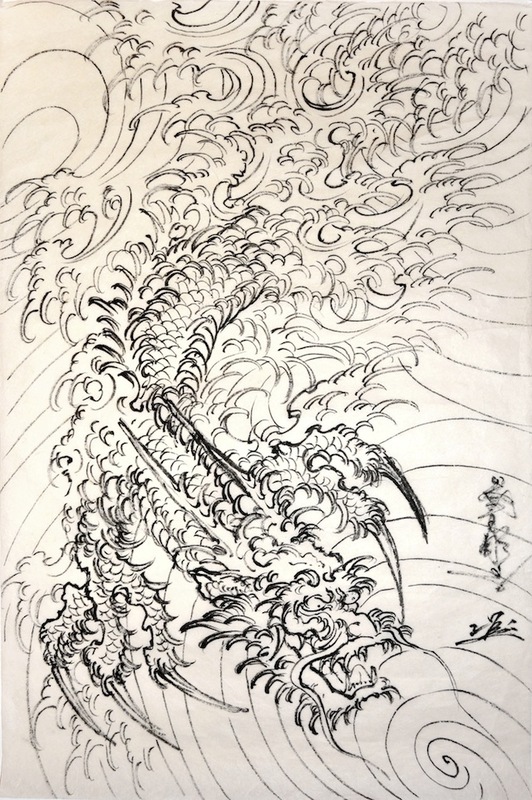 Rendering Japanese folktales, calligraphy and religious subjects in sumi (black ink) and traditional mineral pigments, Horiyoshi III interweaves past, present and future. In addition to painting and drawing, Horiyoshi III tattoos full time, publishes books of his drawings and is the founder of Japan’s only tattoo museum with his wife, Mayumi, in Yokohama. With over forty years of experience, Horiyoshi III is the foremost authority on traditional Japanese tattooing.